ITP has done it again! They have created an all new light, strong and stunning SS112 Sport ATV Wheel. These wheels will definitely turn some heads because of its good looks and the exceptional durability. The SS112 Sport a one-piece aluminum wheel that use a bright, diamond-cut machined surface finish with black accents, all topped with a tough clear coat finish. 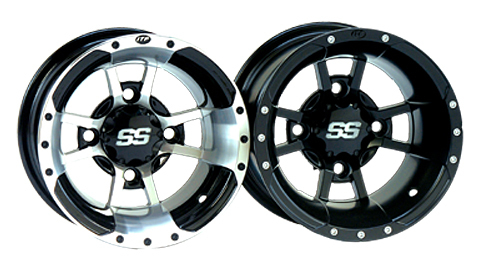 The SS112 Sport wheels come in 10 x 5 front, and both a 10 x 8 and 9 x 8 rear sizes for most sport quads. Center caps included. Wheels are sold individually. Prices vary by wheel size, and start at $75.95. The above part numbers are listed for your reference only to show all wheels available. Not sure of your particular bolt pattern? Click Here.